When writing mapping software I analyse small test pedigrees with the program I am working on and other mapping software like Merlin. However, when using the Merlin software and high density SNP data, the output data consists of a very large results table which due to its size may be difficult to process by eye. 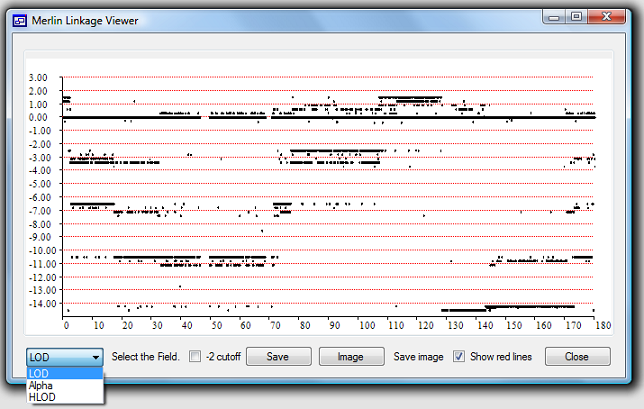 To over come this problem MerlinViewer was developed to visualise the data as a scatter graph of the LOD, HLOD or Alpha score against chromosomal position. The MerlinViewer program first reads the appropriate map file and then the Merlin output text file. After pressing the 'View' button the data is read and displayed as a scatter graph with the x-axis representing the SNPs position and the y-axis representing the SNPs linkage score. Data from a region can be exported as either a tab delimited text file or a html web page. To export data, place the cursor at one side of the region and with the mouse button pressed move the cursor to the other side of the region. Then press the Save button and select the correct file extension and enter the name of the file to save the data too. Each *.map and merlin data file must contain the data for a single chromosome and be the standard format as exported by the program. Carr IM, Johnson CA, Markham AF, Tomes C, Bonthron DT, Sheridan EG. DominantMapper: Rule-based analysis of SNP data for rapid mapping of dominant diseases in related nuclear families. Abecasis GR, Cherny SS, Cookson WO and Cardon LR (2002). Merlin-rapid analysis of dense genetic maps using sparse gene flow trees.